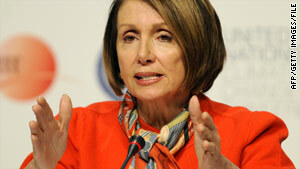 Nancy Pelosi said staff will provide comparison of bills soon to help members prioritize the changes they want to see. Washington (CNN) -- House Democrats are already home for the holidays, but they huddled on a conference call Wednesday afternoon to discuss the next steps in negotiating a final health care bill with the Senate. Speaker Nancy Pelosi restated that the goal is to get a final bill to the president's desk before his State of the Union address in late January or early February, but she admitted the timeline could slip, according to two senior Democratic aides who were on the call. Members made it clear to House leaders that they don't want to simply accept the bill that is expected to pass the Senate on Thursday morning, the aides said. "Their point is that while both bills are a major step toward making affordable, quality health care available to all Americans, the House bill has quicker reform, is more affordable and covers more people," according to one of the aides. The Wednesday call followed a Tuesday meeting that Pelosi convened via phone with other top House Democratic leaders and committee chairs to map out the House's game plan for a conference with the Senate early next year. Although the House won't be in session until January 12, House staff next week will begin working through the differences in the two chambers' health care bills, according to several Democratic aides. Leaders and committee chairmen will return in early January for health care meetings. The aides were hesitant to get into specific details because the Senate hasn't yet passed a bill, but they emphasize that the House Democratic leaders will push hard for some key elements of their reform measure. Pelosi told rank-and-file Democrats on Wednesday that staff would put together a comparison of the House and Senate bills soon to help members prioritize the changes they want to see in a final bill. Leaders will schedule another conference call with all House Democrats before the House returns in January. The House and Senate will be in session very few days in January and will need to get final cost estimates from the Congressional Budget Office before voting on a bill. Video: Health care changes immediate? Given the reality of the 60-vote threshold in the Senate, there wasn't much discussion among House leaders about pushing hard for the public option the House passed in its final bill. "They [the Senate] tried to see if they had support for it. There isn't. That's the reality," a top Democratic leadership aide told CNN. "I think a lot of people are coming to terms with that, and I don't know how productive it would be to bring it out again." House Democratic leaders will push their Senate counterparts to include more affordability credits in the final bill. They also want the new health care exchange -- where consumers can shop for insurance plans -- to start in 2013 instead of the Senate's start date of 2014. "I think people on both sides of the Capitol would like to see the effective date moved up. Whether we can do that and pay for it is a question," another senior Democratic aide noted. Because most of the major health care reforms won't go into effect until well after the 2010 election, House Democrats also are focused on showing immediate and tangible benefits to consumers. Leaders want a final bill to begin closing what is called the prescription drug "donut hole" for seniors next year. When an individual's drug costs reach $2,700 under current Medicare coverage limits, seniors must begin to pay all costs out of pocket until they reach $6,154, at which point Medicare coverage kicks back in. Under the House bill, this hole in coverage would be cut by $500 immediately and seniors would get a 50 percent discount for some drugs. The House version closes the hole completely by 2019, but the Senate bill takes longer. The aides said keeping cost-control measures in the final bill will be a priority. There will be negotiations over abortion language as well as a fight between the chambers over how to pay for health care reform. The vast majority of House Democrats are on record opposing the Senate's "Cadillac tax" on high-cost insurance plans. But several aides concede that House Democrats may be able to live with a compromise that ups the threshold at which the tax goes into effect. House Democrats also recognize their surtax on wealthy Americans faces problems in a conference with the Senate. In lieu of the House proposal, there is discussion about increasing the rate of the Senate's Medicare payroll tax on higher-income taxpayers. With the health care debate moving to another stage next year, House Democrats are pressing again for President Obama to get more personally engaged in negotiating final details. One senior aide told CNN that there will be push for the White House to change the largely hands-off approach it used in 2009 toward passing the administration's key goals in the House. "House Democrats have been eager to move the president's agenda; they support the president's agenda. But we expected there to be more lifting from the White House," the aide said. Several House Democrats on the Wednesday call also told leaders they are worried that the longer the process drags out, the harder it would be to make the case to voters in their districts about the benefits of passing health care reform, the aides said.